Monarda ‘Petite Delight’ has a few things to get off her petals. Management at May Dreams Gardens is not responsible for nor necessarily agrees with the statements and opinions of this plant. “Hello… is this keyboard working? It is? Okay. Well now, we, Monarda ‘Petite Delight’, have just a few things to say. First of all, we were totally, unjustly and without second thought passed over for Garden Bloggers’ Bloom Day and now we are being featured on this meme called Wildflower Wednesday, sponsored by Gail at Clay and Limestone. Do we look like wildflowers? Don’t answer that, we look all messed up right now because we’ve been blooming for weeks and all this rain has really done a number on our petals. Well, that is sort of right. Okay, we admit it. Our petals look this way rain or shine! Anyway, we are too often associated with our wildflower cousins, that Monarda, also known as bee balm, the ones that spread all over the garden and self-sow, too. Really, they are just wild beyond belief and more than once I’ve seen management here at May Dreams Gardens yank them out by their roots and toss them onto the compost heap. Anyway, we aren’t that wild. We are a fancy hybrid, after all, though we aren’t quite sure of our parentage. But never mind that. We are good flowers, even selected as an outstanding perennial by the Chicago Botanic Garden! We stay tidy and neat and we don’t get tall like our wild cousins. Plus, we rarely get powdery mildew. Oh my sweet pea! Blooming radishes! 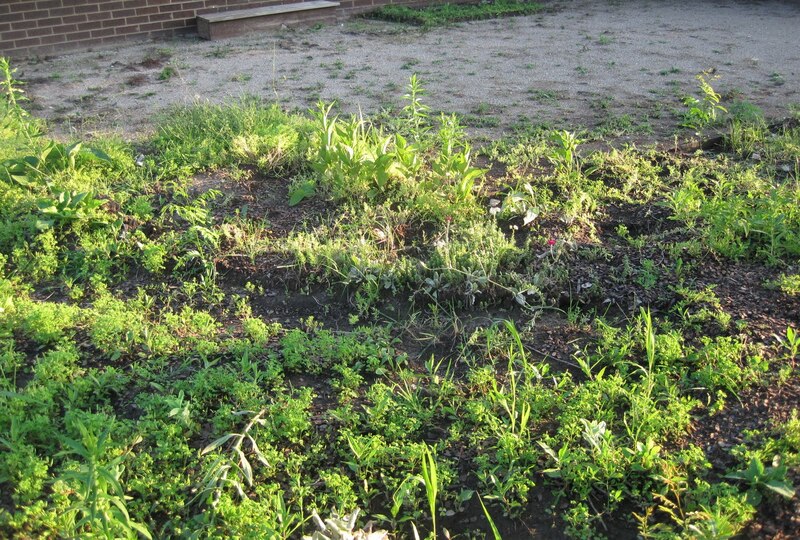 What in the name of chicory and dandelions happened to our original flower bed? And where did the patio go? My goodness. Never mind. We take back our complaint. We are fine back here with the vegetables. That other area has gone to… well wildflowers, if you want to stretch your imagination and call those weeds by the fancy name “wildflowers”. I sure hope management has a plan for that area. Thank goodness we are back here safe and sound in the vegetable garden! Management at May Dreams Gardens would like to assure Monarda ‘Petite Delight’ and everyone else that there is a plan for the patio area… a new, bigger patio. I have Monardas in my garden, 'Petite Delight' too. I really love them for their unusual flowers and scent. Dear 'Petite Delights,' I have three of your sisters living here, and I can attest that they have been very well-behaved and understand their boundaries. They also play nicely with bees and butterflies. I understand your consternation with being moved to the vegetable patch, but I'm sure Carol will soon find you a permanent home where everyone can appreciate your beauty and good manners. Alas, I only have 'wild' monardas in my garden, but the crimson variety growing next to the Black Beauty lilies is a gorgeous happy accident. I like the bright red bee balm, too and it is very popular in our area. Petite Delight has opened up a whole new monarda world to me. Thank you. 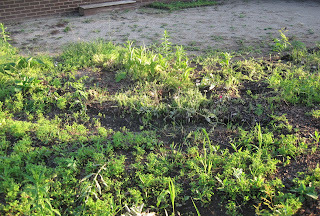 Uh-oh ... now the plants have started blogging, too????!!!! Monarda 'Petite Delight' sure is a pretty thing. 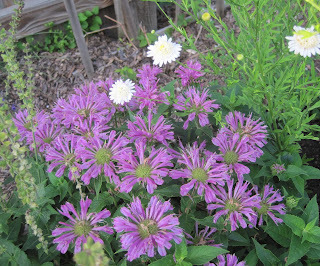 I'm experimenting with just one Monarda this year, but it's not blooming yet. I hope it's as well-behaved and mildew-resistant as you are. Can't wait to see your new patio! I planted Petite Delight last summer and she's a sweetie in my garden too...love her short stature and her anti-social (non-spreading) ways! !